Hydraquip Hose & Hydraulics are a market leader across the UK within the hydraulic and engineering industries, offering complete designed solutions for hydraulic power units and power packs. 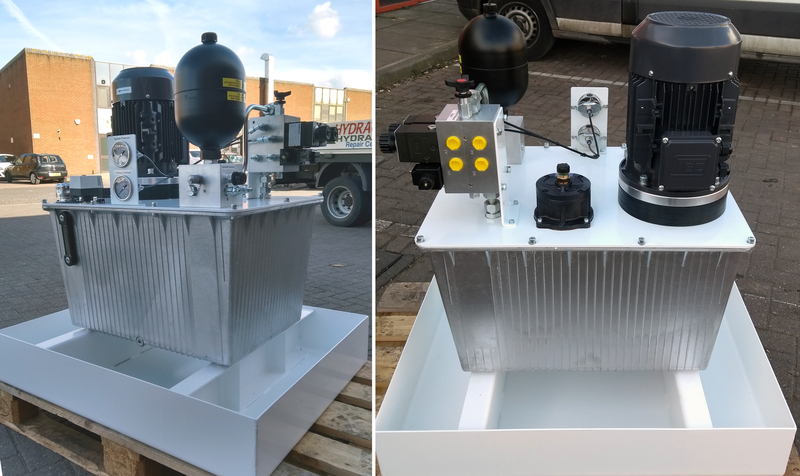 Hydraquip were recently contacted by a worldwide flooring company to design, manufacture and install three hydraulic power units for use on an embossing roller machine. The machine’s function is to add patterns to lino flooring before it is installed, it is of high importance for the machinery to be back in working order as soon and efficiently as possible. The existing units have become worn with obsolete parts which caused a number of leaks within the system due to the line mounting valves and pipe work. Hydraquip’s staff have a wealth of experience allowing them to offer a complete service of project understanding, design, build, installation and servicing tailored to meet each customer’s individual requirements from start to finish. Hydraquip were given specifications and requirements from the customer and it is then the job of the engineers to design the most efficient solution for the machine. The three units have been supplied to the customer with installation and commissioning booked for later this month. The new systems include a bespoke manifold design incorporating control valves in turn reducing interconnecting pipe work, giving a cleaner layout with less possible leak points. The manifolds are hydraulically designed by Hydraquip with manifold schematics provided to the customer for approval before installation. Each unit was mounted on a sump drain capable of holding the total reservoir capacity, to ensure that no fluid can escape to the floor and preventing a possible slip hazard. Several factors were considered when designing the new units to ensure the highest level of efficiency for the machine. The systems incorporate functions such as internal return filtration which is important on all hydraulic systems to help reduce wear by keeping contamination levels low. The filter chosen by Hydraquip’s engineers had all the connections inside the reservoir hence the internal filtration system meaning less external pipework and in turn less leak points. A minimum level switch and a maximum fluid temperature switch allow for remote monitoring and operation. There are three internal hoses on the HPU with four on each unit as well as some 12mm pipework. The hose assemblies will consist of Manuli 1/2” 2SC Rockmaster hose complete with DIN metric end fittings. Hydraquip supply a number of reputable brands such as Bosch Rexroth whose valves have been sourced and fitted to the units ensuring high quality products are used every time. All three units will be installed by Hydraquip’s engineering team as well as being commissioned on site offering the customer a complete service and peace of mind about the full work carried out. Hydraquip provide general and operational manuals for every machine they have worked on and also offer test certificates for their power units. To reduce the potential for failures in the future, Hydraquip offer tailored maintenance programs, recommended spares, cylinder refurbishments and servicing providing customers with cost effective solutions and a reduced machinery downtime.